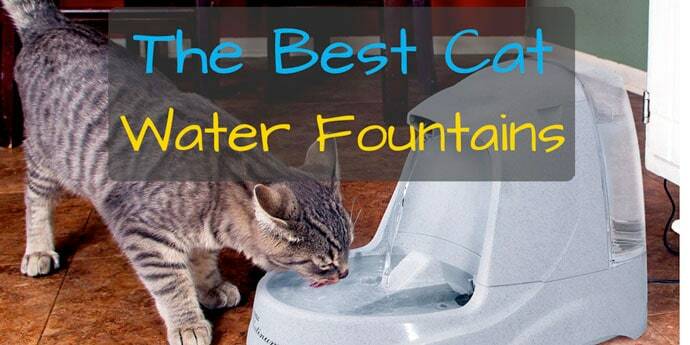 Having a water fountain in the house for your cat can be quite handy for your furry friend. Saving you multiple trips per day to fill up your cat’s water bowl, there’s no going wrong with a kitty water dispenser that can last for several days to week without a refill. 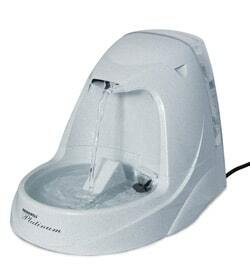 We’ve compiled in depth reviews of the best cat fountains on the market today so you don’t waste your time making the wrong decision. Take a look through our pros and cons of each drinking fountain, and then make your decision! Our top 3 fountains tend to sit well above the rest of the pack when it comes to reliability, durability, and overall features for the money. Many are ceramic fountains that offer aesthetically pleasing designs combined with maximum functionality. Ranked as one of our top two water fountains on the market, you really won’t be disappointed with the Avalon. 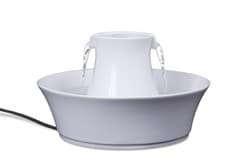 It is a very nice looking ceramic fountain that ranks high mainly because of the easy ability to clean it and having multiple levels of water feeding available. The Drinkwell Platinum is another of our top rated dispensers because of its minimal noise, durability and longevity. The 5 inches of free falling water tends to encourage cats to drink more water. The submersible motor is a plus and the special pre-filter helps avoid the frustration of clogging by removing hair and dirt. 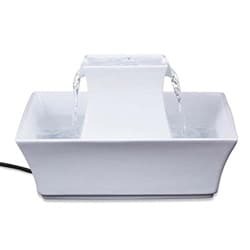 The Drinkwell Pagoda fountain is a beautiful looking dispenser that is quiet, easy to clean, and perfect for cats that have an allergy to plastic due to its lack of plastic in the drinking areas. A large capacity holder and charcoal filter round off another top pick for ceramic water fountains. 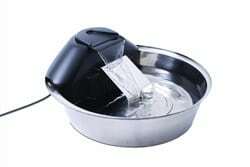 While some people are willing to splurge a little more for a top of the line pet fountain for their cats, it’s not always necessary and many of these dispensers we’ve listed below are still highly rated. They may not have as many features, but still tend to get the job of hydrating your furry friend as needed. The Drinkwell Multi-Tier pet fountain offers a nice alternative option in the free-falling stream that cats tend to be attracted to. The water circulates rather well and is filtered by charcoal filters. With one of the larger water capacities and multiple levels, it does present as a great drinking option for multiple cats at once. 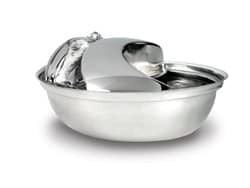 The Zen Steel water fountain for cats offers a monstrous 128 oz capacity and oxygenated, circulating water system that keeps the fresh water moving. This again tends to keep your cats interested in staying hydrated. 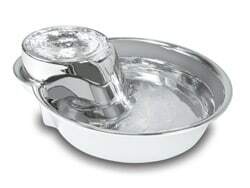 The stainless steel bowl is very bacteria resistant unlike many of its counterparts and tends to be more hygienic than most other options. 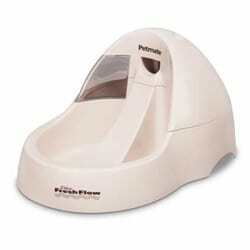 The Pioneer Pet Big Max cat fountain consists of a heavy duty multi-level design. Cats can drink out of both tiers and the stainless steel keeps the water fresh and resistant to forming bacteria in short time periods. 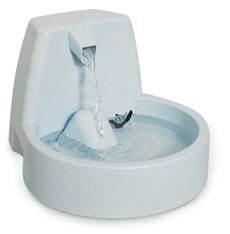 One of the quietest fountains we’ve tested and large capacity make this an excellent option for your cat. 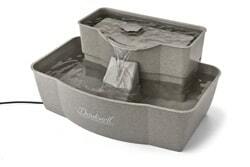 The enticing constantly circulating water in the Drinkwell 360 Cat Fountain tends to make your cat drink more often. The 360 degree design with free falling water from all sides makes it suitable for a multi-cat household. The water streams are completely customizable and come with different spout rings to adjust as needed for your furry one. A unique multi-level design attracts cats to the Cat Mate Pet Fountain. 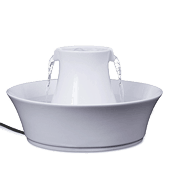 This product is definitely one of the quieter ones and flows evenly for constant fresh water. 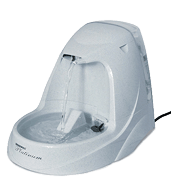 The water flow speed can be adjusted to your cat’s choosing and the fountain flow doesn’t splash quite like many other similar fountains. Here you’ll find some other dispenser options we’ve taken the time to do reviews for, but seem to have a flaw here or there that couldn’t quite get them above the 4.0 star rating. That being said some may work for cat owners with specific needs or specific price ranges. The Petmate Fresh Flow features a submersible pump which keeps this unit relatively quiet. The water slide design allows for cats that tend to be a little more afraid of running water to confront their fears easier. 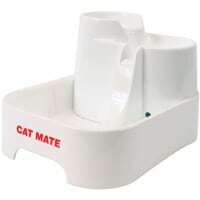 Although not a great feeder for multiple cats, it is a solid starter pick. 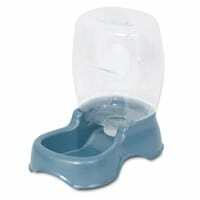 An elegant looking pet fountain with a smaller 60 oz water capacity is a good starter product. The design allows for minimal splashing and maximum water circulation, and charcoal filters ensure the water stays fresh and clean. Although this water fountain is simple and easy to set up, the capacity is minimal at 50oz. 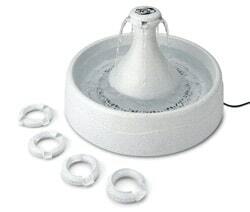 The Original 50 oz Pet fountain does have replaceable charcoal filters and offers a 5 inch falling water system, which constantly circulates water. Although it lacks in some features, the price point cannot be beat. Not everyone needs a fancy cat water fountain with fresh water circulation features. 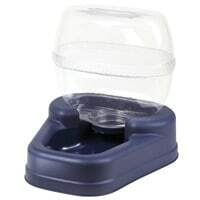 If you’re in the market for a low budget water dispenser that gets the simple job done of keeping your cat hydrated with water for a few days without refilling the bowl, then these dispensers are right for you. Some may wonder why to even consider buying a fountain at all for your furry one. Why not just fill up a water bowl for them to drink out of? It’s a luxury, but it’s a time saver. The real answer to this question really lies with the cat and its owner. For some it may not be necessary, but for others that want to save some time and keep their cats hydrated, it may be a plausible solution for both. If you care deeply about the health and well being of your feline friend, the benefits of investing in a cat fountain for them seem to far outweigh any cons. Please note that these cat water fountain reviews are here to serve as a guide in making the right decision for your cat. Make sure to consider all of the options presented. Remember that only you know how your cat reacts to certain stimulation so make sure to take this into consideration when picking the right cat water fountain for your furry loved one.